Have you tried turning USA off and on again? Here’s what’s up in the world of TV for Wednesday, July 13. All times are Eastern. Suits (USA, 9 p.m.): Season six of Suits—which arguably should be the final season—is here, with “To Trouble.” Yes, we’re aware Mike and company are already in trouble, but the episode title is what it is. Anyway: “Mike transitions to prison life while Harvey, Jessica, Louis, Donna, and Rachel deal with the fallout of Mike’s plea deal and try to prevent what’s left of PSL from collapsing.” This is the final season, right? It makes no sense for it not to be the final season, right? Right? Right?!? But hey guys, Suits is back! Mr. Robot (USA, 10 p.m.): Sorry, Mike Ross, but your (completely self-made) problems aren’t so big compared to Elliot Alderson’s. Yes, finally, the 90-minute second-season premiere of Mr. Robot is here. 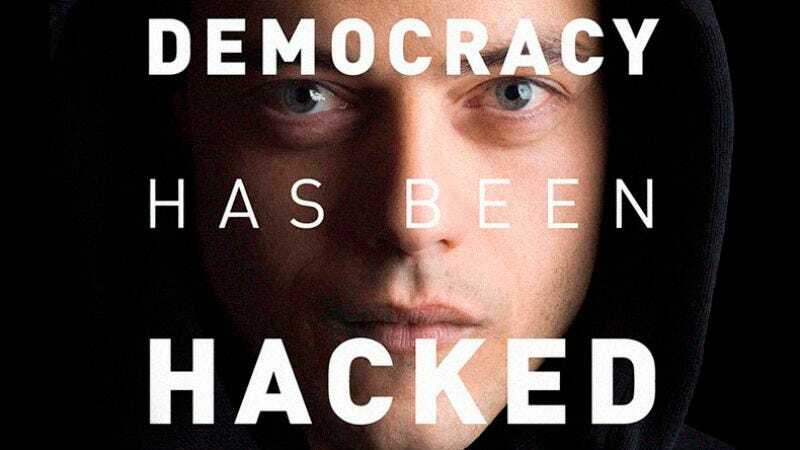 Remember all that time when Mr. Robot’s second season wasn’t here? Well, sure—you’re most likely reading this during that time. Anyway: “back. one month later and omfg, five/nine changed the world. elliot in seclusion. Angela happy at evil corp. fsociety delivers malicious payload. TANGO DOWN?” Ah, we’ve missed your in-character episode synopses, Mr. Robot. We’ve missed you, Mr. Robot. And, of course, we’ve also missed Alex McCown’s Mr. Robot reviews. Penn & Teller: Fool Us (The CW, 8 p.m.): The third-season premiere of Penn & Teller: Fool Us asks a simple enough question: “Won’t Get Fooled Again…?” Okay, that’s a pretty abstract question based on the series’ premise, but you get it. As usual, “aspiring magicians are invited to perform their best trick to try and fool the world-famous team of Penn & Teller, who will get to see the trick only once and have to immediately try to work it out. Anyone who succeeds wins the right to perform with Penn & Teller in their celebrated show at the Rio Hotel & Casino in Las Vegas.” Also, Alyson Hannigan is around. Basically, this is an option for all of you non-jocks who don’t want to watch the ESPYs. Supernature - Wild Flyers (PBS, 8 p.m.): Yes, another one of your nerd shows is on tonight. The first season of Supernature - Wild Flyers ends with “Crowded Skies,” in which you’ll “see why survival in the sky depends on more than beating gravity or mastering flight.” Classic nerd stuff. Of course it’s on the same time as the super important sports awards show. Of course. Whose Line Is It Anyway? (The CW, 9 p.m.): A new time slot for Whose Line sees another Jeff B. Davis guest comedian appearance. We’re not sure Alyson Hannigan is around, but we’ll see. Mr. Robot (iTunes/Amazon Video/USA Network)/The IT Crowd (Hulu/Seeso/Amazon Video/Netflix): Catch up with all of Mr. Robot season one before it’s too late! If you’ve already done that, you can watch something lighter, like The IT Crowd. It’s a win-win.